Using the Atacama Large Millimeter Array (ALMA) located in the Atacama desert of northern Chile, astronomers were surprised to discover evidence that could point to a massive new planet X at the edge of our own solar system. Given this startling revelation, scientists now concentrated all their efforts to identify the object whose nature remains completely unknown for now! Although we thought to know everything about the configuration of our solar system, however it seems that we still have to unlock some secrets. Indeed, by using the ALMA radio telescopes in Chile, two independent teams of scientists spotted undetected object lurking on the furthest edge of our solar system. As the scientists explain in a paper uploaded on December 10 to arXiv — not yet been formally published or peer-reviewed, this celestial body is so far from the sun that they first thought it belonged to our neighboring binary star Alpha Centauri. The Alpha Centauri star system is about 4.37 light years of our sun consisting of three stars, the pair Alpha Centauri A and Alpha Centauri B, two main stars orbiting around each other and a small and faint red dwarf, Alpha Centauri C — better known as Proxima Centauri — and some scientists think there’s at least one planet orbiting around the binary Alpha Centauri AB. But in separate pairs of snapshots — taken over a period of months — respectively July 7, 2014 and May 2, 2015, astronomers noticed that the object in question seemed to move swiftly against the ‘fixed’ background stars. Given this observation, scientists have concluded that the celestial body was much closer to Earth than was previously thought. The authors say the object is not also a star, such a star would have been bright enough to be seen before. It is also not likely to be part of Alpha Centauri star system, rather astronomers believe the mysterious object is somewhere between 10 billion and 2 trillion miles from Earth. write the authors in the study. 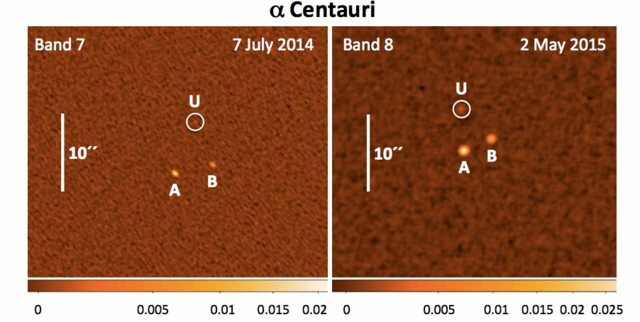 Unless there are yet unknown, but significant, issues with ALMA observations, we have detected a previously unknown objects in our solar system. We argue that the object is most likely part of the solar system… albeit at a distance too far to be detectable at other wavelengths. Moving object near Alpha Centauri star system. It’s labeled as U in the image. We have three guesses for what it might be: a small icy chunk about 9 billion miles away from Earth, a “super Earth” (that would fit the bill of “Planet X”) orbiting somewhere around 28 billion miles away from Earth, or it could be a brown dwarf much farther away — about 20,000 Astronomical Units (AU) from Earth. Fun fact: if it is true that ALMA accidentally discovered a massive outer solar system object in its tiny tiny tiny field of view that would suggest that there are something like 200,000 Earth sized planets in the outer solar system. Which, um, no. Even better: I just realized that this many Earth-sized planets existing would destabilize the entire solar system and we would all die. Even if real, these objects might not be part of our solar system at all. Maybe they’re (each) actually two separate, distant galaxies, both of which change brightness over time so one brightened while the other faded. I know, that’s a reach, but it shows there could be other explanations. Astrophysicist Brian Koberlein wrote on Forbes. Whether dwarf planet, super-Earth or small star, it seems clear that something is lurking on the outer edge of our solar system. Meanwhile, astronomers will continue to study the object with extra instruments in the hope of, some day, they’ll identify it. Whether its planet X or not we will see.